Dental Implants are without doubt the most convenient way to replace missing teeth. They optimally combine comfort, durability with natural looks. Furthermore when you opt to receive dental implant treatment in Greece you can be sure to receive top class dental implants treatment at a very low cost. In this post, I discuss why to restore your teeth using dental implants and why choose Greece in particular. You can save up to 50.000 Euros, when you choose to have Dental Implants in Greece, without any compromising on the quality of treatment or service. Greek dentists are well trained in Greece and abroad, they speak good English and operate state of the art dental clinics. Dental implants restore completely your chewing ability. People with missing teeth often suffer from digestive disorders. Their diet is restricted to soft food, while their body cannot absorb all the needed nutrients adequately. In general people with no or few teeth suffer from poorer health. Teeth are absolutely essential in ensuring clear speaking. When your teeth is missing your speech is distorted. Dental implants return speech function to normal. For a single missing tooth, a single crown implant used. In some cases, when more than one adjoined teeth are missing an implant supported bridge is a better option. When no natural teeth are present implant-supported denture or bridge might be the answer. Dental Implants do not move or slip and they do not require readjustment. Most of the time the only thing that needs replacing is the prosthetic restoration, ie a crowns or dentures that are fitted on top of the implants. When a tooth is lost, the body senses the loss and stops sending vital nutrients like calcium and phosphorus to the area. As a result, the surrounding jaw bone begins to atrophy and might threaten the health of neighboring teeth. 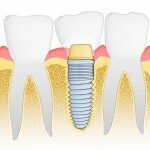 A dental implant replaces not only the crown, but also the root of the missing tooth. Hence the body continues to send nutrients to the area and the jawbone does not shrink. The American Academy of Oral and Maxillofacial Surgeons reports that single dental implants have an average success rate of 95% in a 5 year horizon, In 10 years the number drops to 90%. Care of Dental implants is similar to natural teeth. Remove implant-secured dentures for cleaning every night, just like non-implant dentures. Dental implants will not only restore your missing teeth but also restore the shape and structure of your lips and cheeks. You will instantly look healthier and younger. Thank you for sending us your panoramic Xray. Hi, who do I speak to about getting veneers in Greece? Please send me a message attaching a close picture of your teeth (smiling) at info@gentledentalabroad.co,. I will come back as soon as possible.